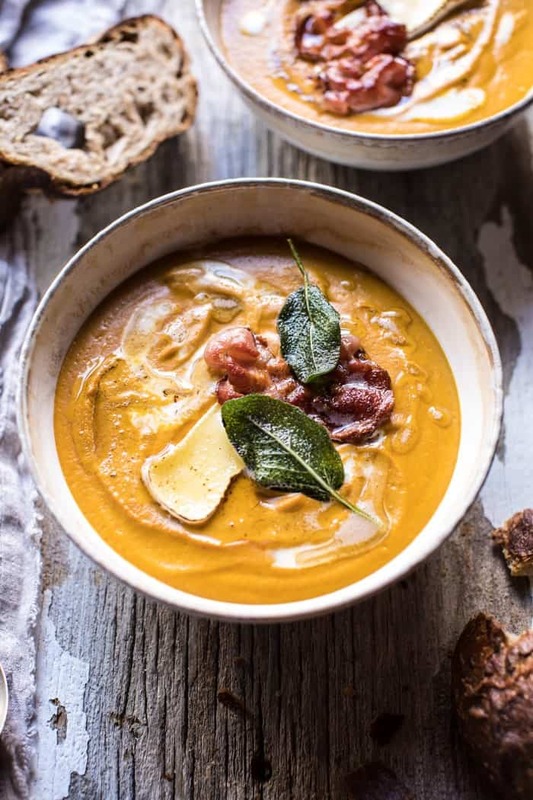 Butternut Squash and Brie Soup with Crispy Pancetta. 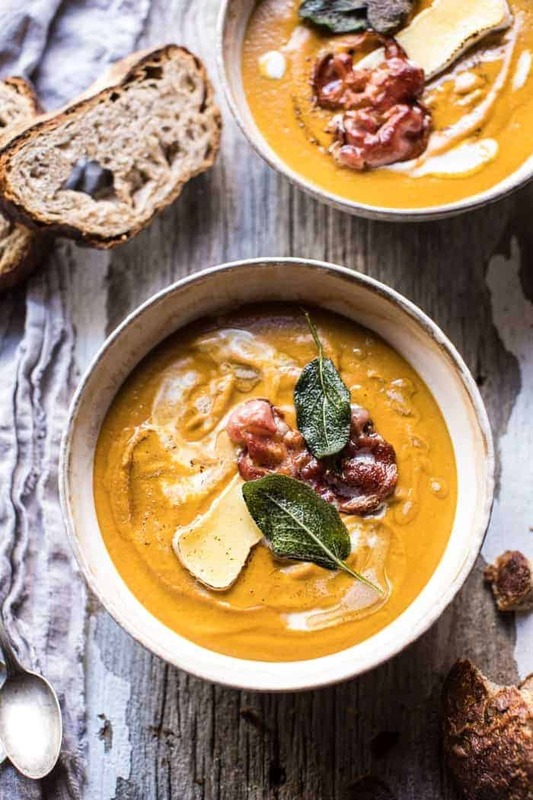 What better way to start the week than with this butternut squash and brie soup with crispy pancetta on top. You guys, please tell me it’s starting to feel a little chilly where you live? I feel like I am the only one experiencing cool weather and it’s making me wonder if all my soup recipes are just a tad outta place. Of course that’s clearly not stopping me from telling you all about them, but still, I am hoping some of you are starting to feel autumn’s chill…I mean we are more than halfway through October. Ahh, and speaking of being half way through the month? I still have so much to cross off on my fall bucket list. So excited about all the fun projects I am working on, and the upcoming holiday season. We are working endlessly on the new Studio Barn (new post coming next week! ), along with correcting some of the issues in the new redesign (sorry guys…hang in there with me), of course…creating content, and multiple other things happening behind the scenes. Everything is so exciting, but at times can be a little overwhelming too…my self doubt and negative thoughts have definitely been getting the better of me recently, and I’ve got to focus on pushing all of that out of my head. My goal for the week is less thinking/stressing/worrying and just more doing. Or I hope so anyway! And that’s my Monday positivity pushing its way through…fake it till it’s real, right. Okay. 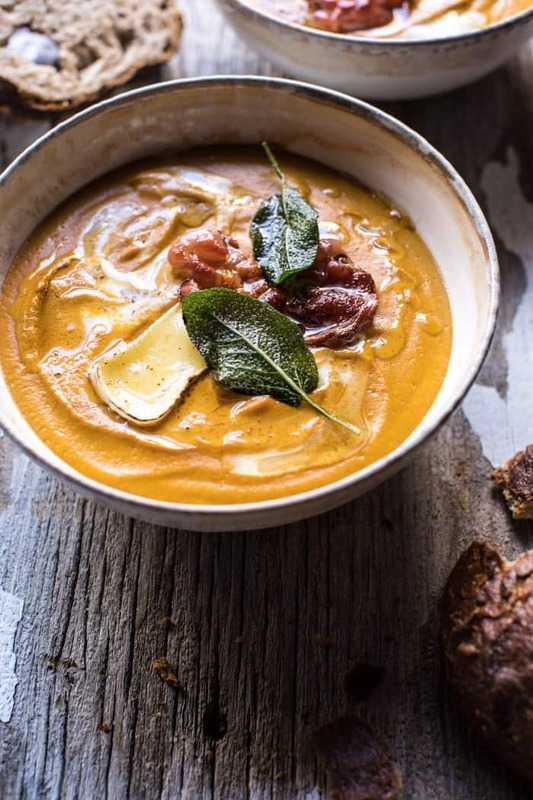 And jumping right into this recipe today because, I mean, what could not be delicious about a butternut squash and brie soup? It’s truly the best bowl you could ever cozy up to. Again, BRIE soup…with roasted butternut squash…AND crispy, salty pancetta. Honestly, I don’t really have words to describe just how amazingly good this recipe is. Sometimes, actually kind of a lot recently, I’ll have recipes that turn out good, but not awesome. In the last two weeks I have ditched a handful of recipes I intended to show you guys this month. This soup however…well, let’s just say that the second I started making it, I knew it was going to be blog worthy. The smells coming from the oven as the butternut squash slowly roasts with garlic and spices infuses the house with the delicious smells of autumn. The creaminess of the brie made me do my little “happy dance” as I sat at the stove stirring (and tasting…) the soup. And the saltiness of the crispy pancetta laid overtop of each bowl simply seals the deal. This soup is nothing short of perfection. The squash, garlic and spices are slowly roasted together in a large oven safe pot (I used my favorite Cocotte), then pureed in a blender, returned to the same pot, and set on the stove to finish cooking. 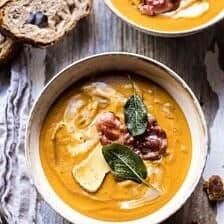 I really wanted create a roasted squash soup that was more of a one pot kind of soup that could go from the oven right to the stove top. 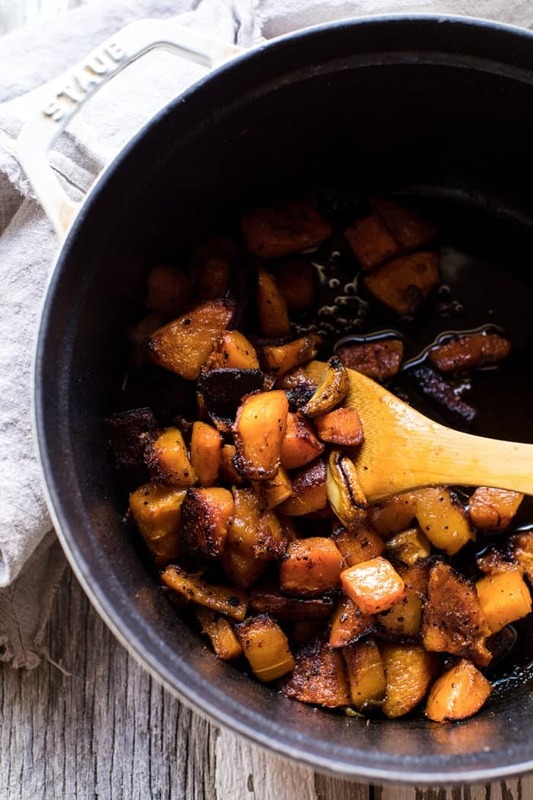 Roasting your squash and garlic instead of just simmering them on the stove allows the sweetness in the veggies to really come out and become caramelized. The squash turns deep golden and becomes extra sweet. This adds that extra layer of flavor that takes the soup to the next level. And then of course, there is the brie. Oh the brie. Yes, we are putting an entire wheel of brie in our soup and I promise it is going to be amazing. Butternut + Brie + Pancetta. Enough said. ps. in case you guys haven’t already figured this out…we pretty much just love brie over here, and I have many more recipes starring this creamy ingredient coming up over the next couple months (holiday food!!!). So basically what really needs to happen is for you to stop at the store on the way home from work, school, or wherever. 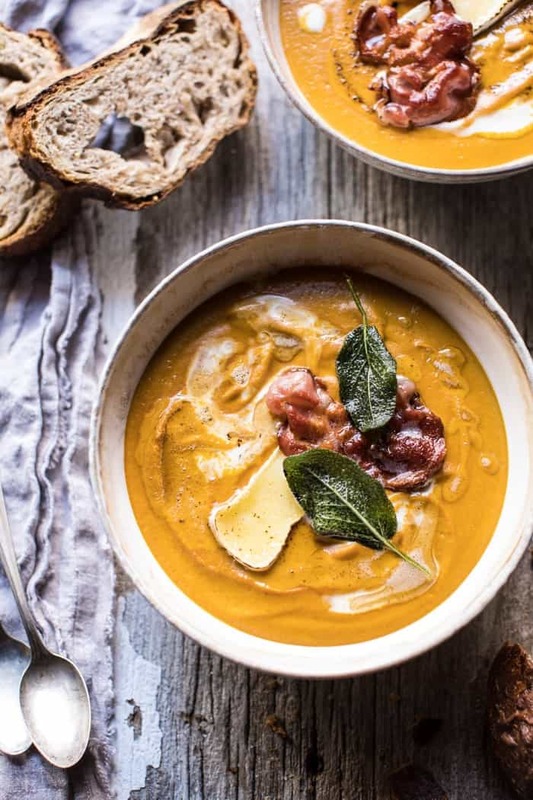 Pick up a butternut squash, a wheel of brie, plenty of sage, and some pancetta. Crank up your oven and start making this soup. Oh, maybe pick up a really good loaf of bread while you’re at the store too. You know, because good soup needs good bread. The smells coming from the oven as the butternut squash slowly roasts with garlic and spices infuses the house with the delicious smells of autumn. The creaminess of the brie made me do my little "happy dance" as I sat at the stove stirring (and tasting...) the soup. And the saltiness of the crispy pancetta laid over top of each bowl just seals the deal. 2. 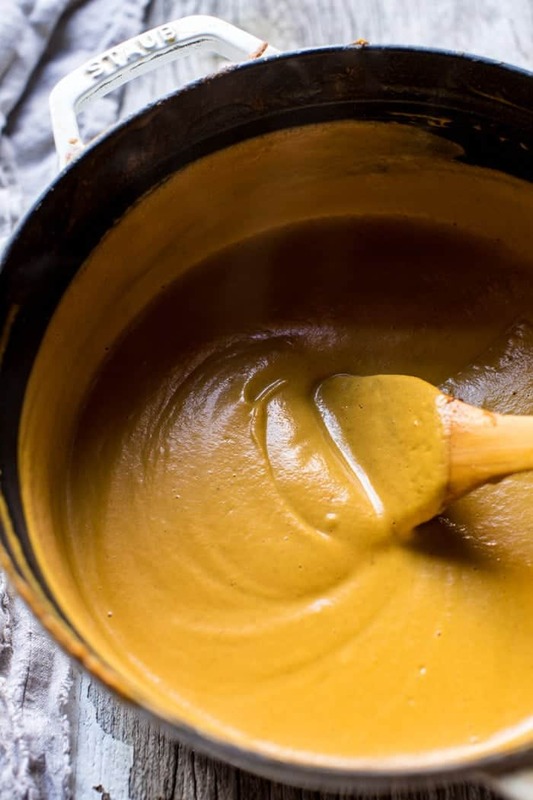 In a large, oven safe soup pot, combine the butternut squash, garlic, olive oil, honey, sage, paprika, cayenne, cinnamon, and a pinch each of salt and pepper. Toss well to combine. Transfer to the oven and roast for 20-25 minutes or until the squash is tender. 3. 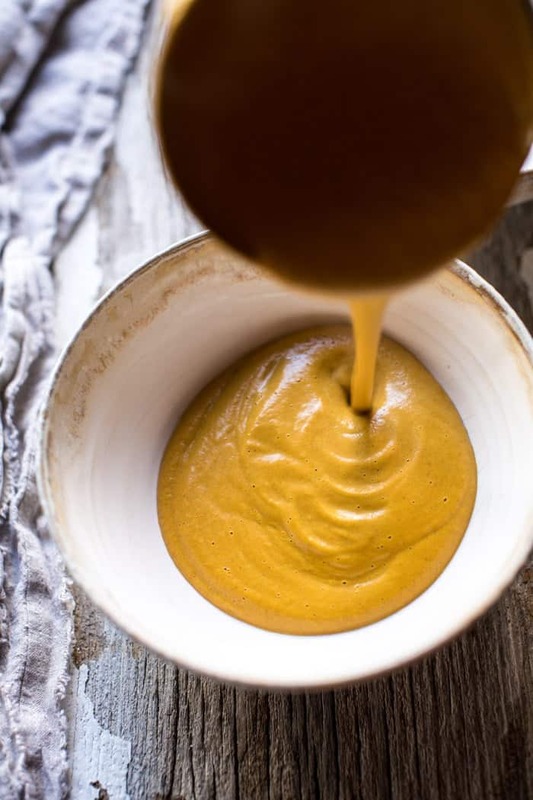 Transfer the roasted veggies to a blender and add the broth, puree until smooth. Return the soup to the pot and set over medium heat on the stove. Add the milk. Bring the soup to a simmer over medium heat, stir in the brie and butter until melted and smooth. If needed, thin the soup with extra milk or broth. Taste and adjust seasonings as desired. 4. Heat a small skillet over medium heat. Add the pancetta and cook until crisp, about 2 minutes per side. 5. Divide the soup among bowls and top with crisp pancetta, sage, and a drizzle of cream, if desired. Enjoy! I’m so glad my boyfriend can’t see this as he’d be rather annoyed at the whole ‘Rachel can’t eat brie’ thing – this looks amazing! Also, I have so much love for your new blog design. I love soup, I always start my meals with a bowl of soup. THis one would surely be a hit here, especially with my son!! Perfect! I hope you love it Ruth! it is not typicall for where I live to be warm tjhis time of the year, but we are experiencing an Indian summer right now (20-22 °C) and I am so pumped about it! I enjoy the sun! However, it doesn’t stop me from making hot soups. In fact, I’ve just posted the recipe on your Apple brie pumpkin soup, but with a lot of modifications. I don’t like using alcohol in my dishes, so I swapped the liquid for TEA instead and it turned out delicious! You can check it out here: >>http://nemehlo-v-kuchyni.blogspot.cz/2017/10/jablkovo-tekvicova-polievkakrem-so.html<&lt;. And now you come with this fabulous recipe?! Oh boi, oh boi, oh boi, I HAVE TO try it! 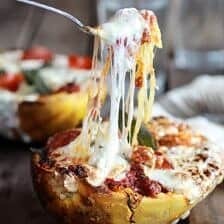 Sounds amazing and I have butternut squash as well as loads of brie on hand. Nothing's gonna stop me from making this. Last but not least, do not let stress and problems overwhelm you, I know it can totally ruin your day, but try to relax and not to worry so much about things. You are an amazing human being and you will go through every obstacle! I believe in you. This blog and your recipes are a proof of it. I enjoy time spent here and looking forward to every post you write. Hey! I am so glad you liked that recipe, and I am sure it turned out amazing using tea! I hope you love this one just as much, thank you! Looks like a really fun soup. Love the idea of roasting the squash, garlic, etc. I’ll need to put this in the try later group. We are super lucky right now with weather in the high 60’s/low 70’s for about the next week and a half! Yeah-hoo! And, I live in Minnesota. Sounds so nice!! I hope you love this Joyce! 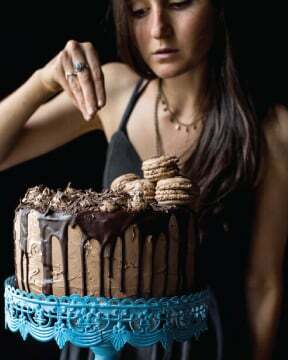 I’d love to make this tomorrow night! Do you know about how big of a squash I need to get to make about 5 cups worth? Thank you, this sounds heavenly! It may be unseasonably hot here in CT, but your soup recipes are on-point. But please do send some cold air this way… we need it!! Haha I am sure it will start to get chilly over there soon! I am so glad you’re loving the recipes though! I love the new design. You asked for input and so far I haven’t been able to print from your printable page. Is anyone else having that problem? Thanks! Thanks Judy! We are working on getting the printing size scaled back down. Should be fixed by the end of the week. So sorry for the trouble! 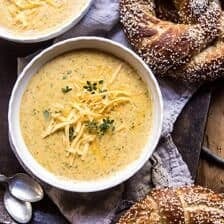 Love this soup recipe! Do you peel your squash before cutting up and roasting? It doesn’t look peeled in the photo, and I don’t see it in the instructions, just wondering. Thanks so much! Oh wow! It is the perfect weather for soup! I hope you love this Natasha! Thanks! This looks so yummy. It’s finally cooled down in NYC and I can’t wait to start making soup! Loving the new site design and know that we’re here to support you through the stress – try not to let it get you down! Thank you Erica, that is so sweet! I hope you love this soup! Wow! 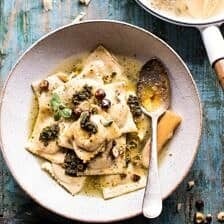 This sounds so rich & creamy! Omg, the new site is gorgeous! Tieghan, I love it. 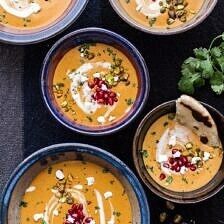 I love this soup too, it looks amazing! Yay! I am so happy you like it Tori, thank you!! Looks wonderful! Can’t wait to make it. Out of interest Tieghan, since you seem to love cheese as much as I do, what’s your favorite brie? Not necessarily the brie you’d most recommend using in this – I imagine that’s a plain good-quality double or triple cream – but your favorite brie for eating purposes? Awh thank you so much Kristin! This is so sweet, and I am sure it will be a great time! 😊 Have a great week! hey buddy. you make my day perfect. i was searching some delicious dish to impress my girlfriend. and i make this for her. and she impressed. thanks for making her happy. your dish makes her happy. Woo! So glad you could impress your girlfriend with this! Thanks! PS. I love your new site design! Thank you Trish! I am so glad you’re enjoying this! 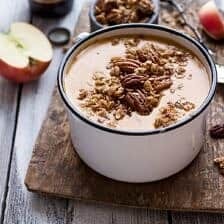 Hi Tiegha, Im so excited to try this but I have a bit of an issue with milk and my skin, do you think i could replace the cows milk in this recipe with almond milk? Just wanted to let you know that I tried this with coconut milk and it was delicious! it was so rich and creamy! Thanks for the advice! That is so great! I am really glad it turned out awesome for you Natalie! 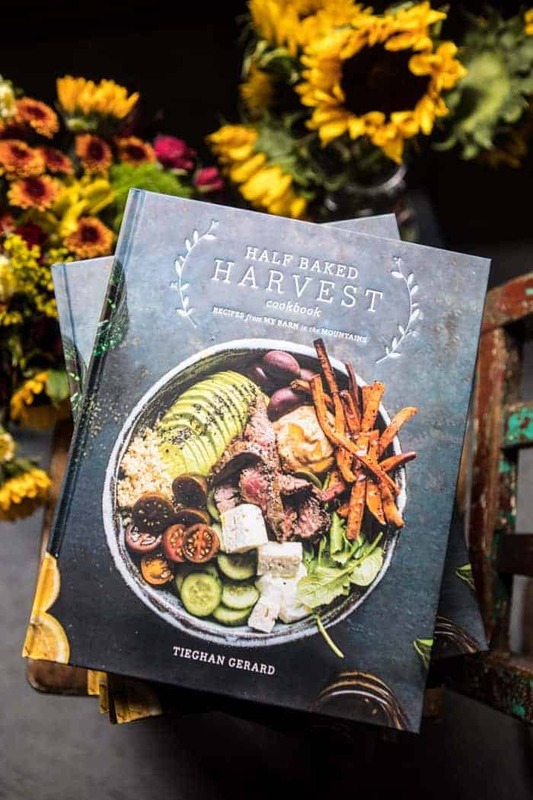 First off I LOVE my new Half Baked Harvest cookbook! 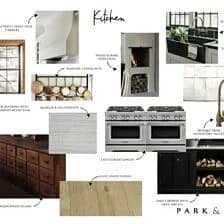 It has been such a pleasure to browse through..the photography is terrific and I appreciate the simple step by step directions! I am considering making this soup for my garden club’s luncheon. I would want to serve each member a small cup of the soup..about 3/4 of a cup per person. Do you think I could double (maybe triple) the recipe or should I make three separate batches? Also aside from the crusty bread, do you have a suggestion for a fall salad that I could include on the side? Any help would be most appreciated! PS: Made your Sunday Night Gnocchi with Italian Sausage last night and got rave reviews from my husband and son! I think tripling the batch should work out just fine! Just be sure to use a big stock pot. As for a salad here are some of my favorite fall salads. I just made this soup tonight and it was TO DIE FOR. This soup was so delicious and mercilessly simple for a cooking novice like myself. I made it for my husband and parents and there were rave reviews all around. I didn’t have pancetta available so I substituted prosciutto. Otherwise I followed the recipe to a T. Perfection! 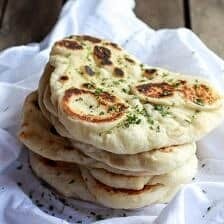 This is the first recipe I’ve ever made of yours and I’ll definitely be trying more! You have a gift! That is so great! I am really glad everyone loved this and I hope you continue to enjoy my recipes! Thank you Carla! Hi! I’m about to make this soup and I think I have way too much squash 🙂 Can the leftovers be frozen? Also, do you think bacon would be a good substitute for pancetta? Thanks you!! 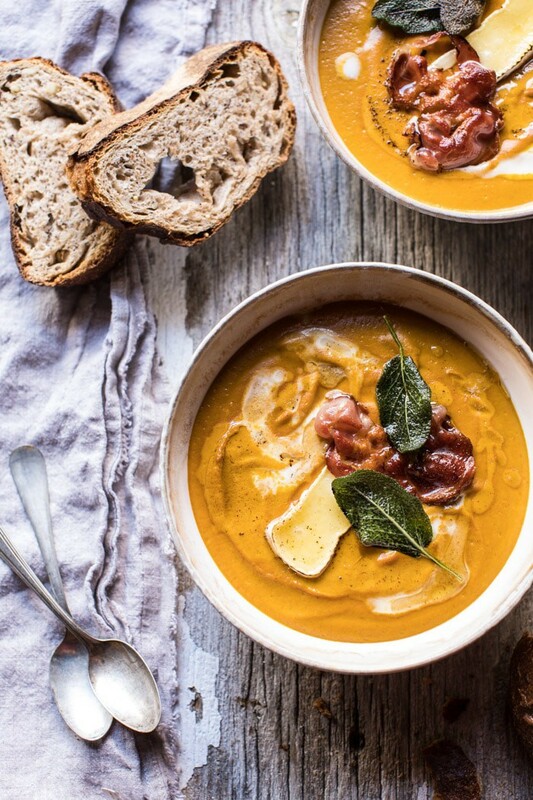 I love butternut squash soup and the brie/pancetta topping is the best! Thank you Laura! So glad you’re loving this! Anyway to thicken the soup mine ended up very thin and theres still chunks of butternut squash in it? Still delicious though. Cooked this tonight, so yummy. This taste of fall is really needed in Florida because it isn’t chilly at all! The only quarrels I have are mostly changes I made. I added an onion, which kind of overpowered the squash. I also used almond milk to cut some dairy, but it just wasn’t creamy enough. Another thing is my brie wouldn’t melt! I don’t know if it was the brand, but I ended up blending it again with the brie. Overall really good. Loved tasting that cinnamon and the spice of the cayenne throughout. Hey Kaitlyn! I am really glad you still enjoyed this recipe! Thank you so much! I made this last night and both my husband and I thought it was AMAZING! I didn’t add the pancetta, but I did roast/puree an apple with the butternut squash and would recommend! Thanks for always being a go-to for a bound to be delicious meal! Hi Maria! I am so happy you and your husband enjoyed this! Thank you! 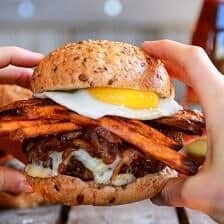 This recipe was amazing (as are all the recipes I make from your site)! Since I’m lactose intolerant, I usually don’t have milk in my house. I ended up using a can of goat’s milk which added a nice little tang to the whole thing without taking away the creaminess of the soup. Thanks again, Tieghan! I can’t wait to make more of your recipes. That is so amazing! I am so glad you enjoyed this Erica! Thanks! I just made this soup and I cannot tell you enough how delish this is. This is to be added to one of my fav soups. Thank you so much! I am so glad you liked this Michelle and hope you love some others on my blog! Hi! I am not a fan of Brie, do you have any suggestions for a replacement or would it be ok to omit completely? Made this delicious soup for the second time today. What can I say? Simply wonderful. Butternut squash and brie, two of my favorite ingredients combined, plus sage (still had in my herb garden) and pancetta. Delish! Thank you for yet another hit recipe, Tieghan! I am so glad you have been loving this recipe, Lena! Thank you so much!